Rate this project Bruce Dubbs has announced the release of version 8.3 of Linux From Scratch (LFS) and Beyond Linux From Scratch (BLFS). LFS is a book that provides step-by-step instructions on how to build a base Linux system from scratch. BLFS expands on the LFS book by giving further lessons on compiling X Window System, window managers and desktop environments, as well as many popular desktop and server packages and their dependencies, thus enabling the user to custom-build a range of diverse Linux systems. From the release announcement: "The Linux From Scratch community is pleased to announce the release of LFS version 8.3, LFS version 8.3 (systemd), BLFS version 8.3, and BLFS version 8.3 (systemd). This release is a major update to both LFS and BLFS. The LFS release includes updates to glibc 2.28, Binutils 2.31.1 and GCC 8.2.0. Changes to text have been made throughout the book. The Linux kernel has also been updated to version 4.18.5. The BLFS edition includes approximately 1,000 packages beyond the base Linux From Scratch version 8.3 book. This release has about 700 updates from the previous version, in addition to numerous text and formatting changes." The books can be read at and download from the project's website: LFS (pkglist) - 8.3 (HTML), 8.3 (PDF), 8.3-systemd (HTML), 8.3-systemd (PDF), BLFS (pkglist) - 8.3 (HTML), 8.3-systemd (HTML). Bruce Dubbs has announced the availability of the latest stable release of Linux From Scratch (LFS) and Beyond Linux From Scratch (BLFS), version 8.4. LFS is a book that provides step-by-step instructions on how to build a base Linux system from scratch (using a standard Linux live system). BLFS expands on the LFS book by giving further lessons on how to compile X Window System, window managers and desktop environments, as well as a variety of popular desktop and server packages and their dependencies. The brief release announcement reads: "The Linux From Scratch community is pleased to announce the release of LFS Version 8.4, LFS Version 8.4 (systemd), BLFS Version 8.4, and BLFS Version 8.4 (systemd). This release is a major update to both LFS and BLFS. The LFS release includes updates to glibc 2.29, Binutils 2.32 and Bash 5.0. A total of 33 packages have been updated. Changes to text have been made throughout the book. The Linux kernel has also been updated to version 4.20.12. The BLFS version includes approximately 1,000 packages beyond the base Linux From Scratch 8.4 book. This release has over 730 updates from the previous version, in addition to numerous text and formatting changes." The books are available for online use as well as free download; the links: LFS (pkglist) - 8.4 (HTML), 8.4 (PDF), 8.4-systemd (HTML), 8.4-systemd (PDF), BLFS (pkglist) - 8.4 (HTML), 8.4-systemd (HTML). Bruce Dubbs has announced the release of version 8.2 of Linux From Scratch (LFS) and Beyond Linux From Scratch (BLFS). LFS is a book that provides step-by-step instructions on how to build a base Linux system from scratch. BLFS expands on the LFS book by giving further lessons on compiling several desktop environments, as well as many popular desktop and server packages. From the release announcement: "The Linux From Scratch community is pleased to announce the release of LFS version 8.2, LFS version 8.2 (systemd), BLFS version 8.2 and BLFS version 8.2 (systemd). This release is a major update to both LFS and BLFS. The LFS release includes updates to glibc 2.27, Binutils 2.30 and GCC 7.3.0. In addition, five new packages have been moved to the base LFS book from BLFS - libffi, OpenSSL, Python 3, ninja, and meson. Changes to text have been made throughout the book. 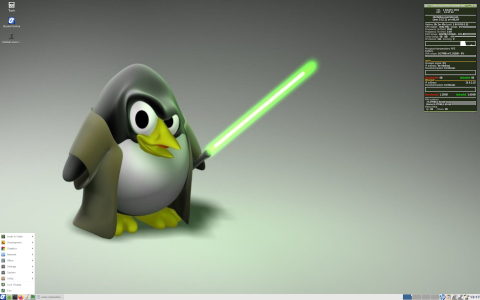 The Linux kernel has also been updated to version 4.15.3. The BLFS version includes approximately 900 packages beyond the base Linux From Scratch Version 8.2 book." The books are available from here: LFS (pkglist) - 8.2 (HTML), 8.2 (PDF), 8.2-systemd (HTML), 8.2-systemd (PDF), BLFS (pkglist) - 8.2 (HTML), 8.2-systemd (HTML). Bruce Dubbs has announced the release of Linux From Scratch (LFS) and Beyond Linux From Scratch (BLFS) 8.1. The new release of the book, which guides readers through building their own Linux distribution, offers many updated packages and several fixes over the previous 8.0 release of the Linux From Scratch instruction book. The release announcement states: "The Linux From Scratch community is pleased to announce the release of LFS version 8.1, LFS version 8.1 (systemd), BLFS version 8.1, and BLFS version 8.1 (systemd). This release is a major update to both LFS and BLFS. The LFS release includes updates to glibc 2.26, Binutils 2.29 and GCC 7.2.0. In total, 32 packages were updated, fixes made to bootscripts, and changes to text have been made throughout the book. The BLFS version includes approximately 900 packages beyond the base Linux From Scratch Version 8.1 book. This release has over 885 updates from the previous version including numerous text and formatting changes." The guides are available in SysV init and systemd editions. Download: (pkglist) - 8.1 (HTML), 8.1 (PDF), 8.1-systemd (HTML), 8.1-systemd (PDF), BLFS (pkglist) - 8.1 (HTML), 8.1-systemd (HTML). Bruce Dubbs has announced the release of Linux From Scratch (LFS) and Beyond Linux From Scratch (BLFS) 8.0, a major update of the do-it-yourself books providing instructions on how to build a base Linux system from scratch, then compile and configure many popular software applications on top of it: "The Linux From Scratch community is pleased to announce the release of LFS 8.0, LFS 8.0 (systemd), BLFS 8.0 and BLFS 8.0 (systemd). This release is a major update to both LFS and BLFS. The LFS release includes updates to glibc 2.24, Binutils 2.27 and GCC 6.2.0. In total, 29 packages were updated, fixes made to bootscripts, and changes to text have been made throughout the book. The BLFS version includes approximately 800 packages beyond the base Linux From Scratch version 7.10 book. This release has over 775 updates from the previous version including numerous text and formatting changes." Here is the full release announcement. The books are available in two variants depending on the preferred init system (SysVInit or systemd); download links: LFS 8.0 (pkglist) - 8.0 (HTML), 8.0 (PDF), 8.0-systemd (HTML), 8.0-systemd (PDF). BLFS 8.0 (pkglist) - 8.0 (HTML), 8.0-systemd (HTML). Bruce Dubbs has announced the release of Linux From Scratch (LFS) 7.10, the latest version of the project's electronic book of step-by-step instructions on how to build a base Linux system from scratch. A separate book, Beyond Linux From Scratch (BLFS), which extends the base system with additional desktop and server applications, has also been released: "The Linux From Scratch community is pleased to announce the release of LFS 7.10, LFS 7.10 (systemd), BLFS 7.10 and BLFS 7.10 (systemd). This release is a major update to both LFS and BLFS. The LFS release includes updates to glibc 2.24, Binutils 2.27 and GCC 6.2.0. In total, 29 packages were updated, fixes made to bootscripts and changes to text have been made throughout the book. The BLFS version includes approximately 800 packages beyond the base Linux From Scratch 7.9 book. This release has over 810 updates from the previous version including numerous text and formatting changes." Here is the brief release announcement. The books are available in both standard (SysVInit) and systemd editions; download links: LFS 7.10 (pkglist) - 7.10 (HTML), 7.10 (PDF), 7.10-systemd (HTML), 7.10-systemd (PDF). BLFS 7.10 (pkglist) - 7.10 (HTML), 7.10-systemd (HTML). Bruce Dubbs has announced the release of Linux From Scratch (LFS) 7.9, a book of step-by-step instructions on how to build a base Linux system from scratch. Beyond Linux From Scratch (BLFS) 7.9, a separate book that extends the base system with additional software packages for desktops and servers, is also out: "The Linux From Scratch community is pleased to announce the release of LFS version 7.9 and BLFS version 7.9. This release is a major update to both LFS and BLFS. The LFS release includes updates to glibc 2.23, Binutils 2.26 and GCC 5.3.0. In total, 25 packages were updated and changes to text have been made throughout the book. The BLFS variant includes approximately 800 packages beyond the base Linux From Scratch 7.9 book. This release has 597 updates from the previous version including numerous text and formatting changes. A major change to BLFS includes the addition of the KDE Plasma 5 desktop." Read the rest of the release announcement for more information. Download the latest LFS and BLFS books from here: LFS-BOOK-7.9-NOCHUNKS.html (HTML, 2.0MB) LFS-BOOK-7.9.pdf (PDF, 1.7MB), BLFS-BOOK-7.9-nochunks.html (HTML, 9.3MB). Linux From Scratch (LFS) is a guide that provides readers with the steps necessary to build a custom Linux-based operating system. The LFS project has published a release candidate for people to test and provide feedback. The latest version of the LFS book, 7.9-rc1, features a number of package updates and provides instructions for working with both SysV init and systemd software. "The Linux From Scratch community announces the release of LFS Version 7.9-rc1. It is a preliminary release of LFS-7.9. Major changes include toolchain updates to binutils-2.26 and gcc-5.3.0. In total, 24 packages were updated since the last release. Changes to the text have also been made throughout the book. The Linux kernel has also been updated to version 4.4.1. We encourage all users to read through this release of the book and test the instructions so that we can make the final release as good as possible." Further details can be found on the project's news page. Download: LFS-BOOK-7.9-rc1.tar.bz2 (210kB, MD5), LFS-BOOK-7.9-systemd-rc1.tar.bz2 (172kB, MD5). Bruce Dubbs has announced a new release of the Linux From Scratch (LFS) guide to building a Linux distribution from the ground up. The latest edition of the LFS book, version 7.8, and its companion book Beyond Linux From Scratch (BLFS) explore how to set up a functioning Linux system from individual source packages. While the main edition of LFS guides the user through setting up a system with SysV init, there is an alternative edition of LFS which explores using the systemd init software. "The Linux From Scratch community announces the release of LFS stable version 7.8. It is a major release with toolchain updates to glibc 2.22, Binutils 2.25.1, and GCC 5.2.0. In total, 30 packages were updated and changes to boot scripts and text have been made throughout the book. You can read the book online, or download to read locally. In coordination with this release, a new version of LFS using the systemd package is also being released. This package implements the newer systemd style of system initialization and control and is consistent with LFS in most packages." The release announcement for LFS 7.8 can be found on the project's website. Downloads: LFS-BOOK-7.8-NOCHUNKS.html (2.0MB), LFS-BOOK-7.8.pdf (1.7MB), BLFS-BOOK-7.8-nochunks.html (9.1MB).